As you might remember, I participated in Ms Midge‘s Heather Bailey Charm Swap and subsequent Charm Along recently? Look at all of the pretties we swapped!! Wonky Stars!! 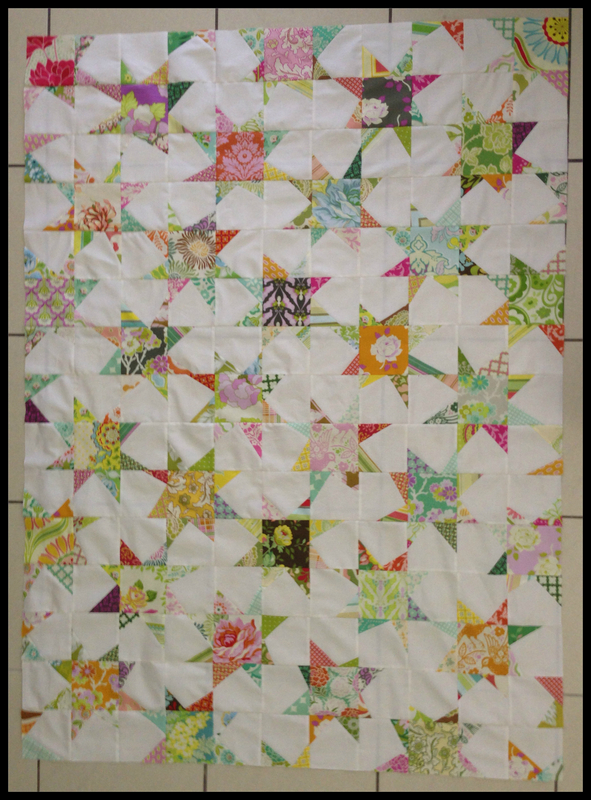 Can you see the secondary white wonky pinwheels? I am working tomorrow, but planning on whipping up a quick backing on Sunday and quilt it next week some time. Anyhow, this one was meant to be a shorty – see you with a finish next week hopefully! I like the soft quietness of the colours, myself. It has a charming vintage feel. You *could* make the pinwheels stand out more by quilting them 1/4″ in from the edge in colour, so that they become independent shapes…?